I had a request from a friend for a raisin pie. Raisin pie?!?!?! Really? I'll be honest. I like raisins, but the idea of a raisin pie does not sound terribly appealing to me. 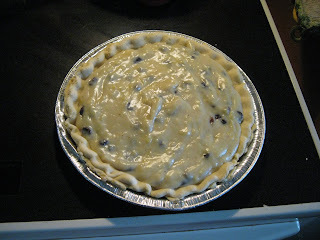 Nonetheless, I decided I would attempt a raisin cream pie in order to satisfy my friend's request. So, here it is! 2. Prepare 1 Easy Peasy Pie Crust. Prick the crust several times with a fork and bake for about 10-15 minutes or until golden. 3. 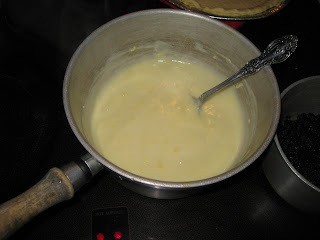 Blend together sugar, flour, egg yolks, and salt. Add milk and vanilla. 4. 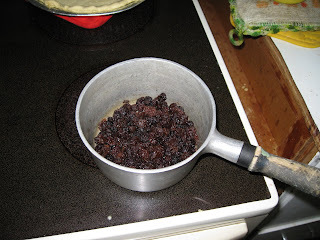 Mix raisins with water and heat slowly, covered, for about 5 minutes. 5. 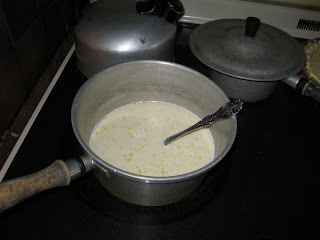 Cook milk and sugar mixture until thick and creamy, stirring constantly to avoid scorching. 6. 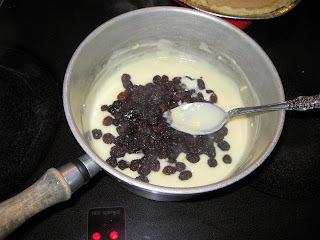 Add raisin mixture. Cool 3 minutes. 7. Add lemon mixture and stir well. 8. Pour into cooled pie shell. Although I was a bit skeptical, I think this pie turned out pretty well. There was a bit of leftover filling which I tried. I was pleasantly surprised by the flavor. I was afraid the raisins would be overpowering, but I didn't find that to be the case. I think the lemon extract really adds a lot to the cream filling. Also, I think you could put meringue on top of this pie (so you can use the whole egg and not just the yolks). All in all, if I got another request, I would happily make this pie!